The Legend of Zelda: Majora’s Mask 3D for the 3DS is a must have for every Zelda fan but also a great experience for every adventure gamer. I played the original on the N64, but as soon as the remake was announced I just couldn’t wait to explore all of terminal all over again. Nintendo didn’t just port the game to the 3DS but actually looked at several crucial gameplay mechanics and made it an optimal experience for its handheld. Do watch out, this review about Majora’s Mask for the 3DS contains several small spoilers. The game let’s you play as the same link from Ocarina of Time after he got turned back into a child by Zelda to live the seven years that he would have otherwise skipped when he pulled out the Master Sword out his socket. The game starts in a dark forest whereas Link is walking with Epona until they both get startled by two Fairies and the Deku Kid with the Majora’s Mask. They steal Epona and the Ocarina of Time and Link goes into pursuit. He eventually reaches the trio and Link gets turned a Deku Scrub. One of the fairies (Tatl) gets stuck by Link and she commands Link to look for the Deku Kid and her brother. 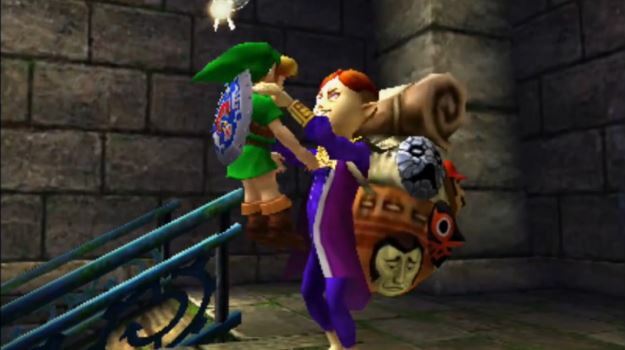 During the chase you meet the Mask salesman and he tells you about the evil that lurks inside the Majora’s Mask and he asks you to retrieve it. This is the point when your quest really begins and the game starts. Completing your quest does have a sudden time pressure because you see, within three in-game days the Moon will crash of the land of Termina and everything will be destroyed. So it’s best to get to work right away! On a certain point in the game you eventually get a certain control of the flow of time. And this the main gameplay mechanic in this game. You will be replaying the three in-game days a lot but with constantly completed different quests on different times and places. The game is one of the darkest Zelda game and handles themes like death, abondness, love, guild and sorrow. The moon that always grins above everything and is slightly coming closers gives you an actual feel of pressure and this is one the things that differs this Zelda with any other. It really makes you think about your action and you will be planning on where to be on what time to make sure you get the the side-quests done. The game is also centered around masks. You will receive masks that give you special powers or just make you look funny and even though you don’t need to collect all the masks, it does gives you a very special reward if you do. 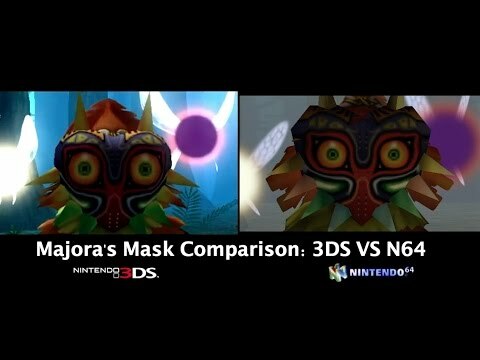 There are also three main masks that makes you transform in a certain race in the Zelda Universe. This way you get the control of Deku-Link, Goron-Link and even a Zora-Link. Each has it’s own abilities, strength and weakness and the game make sure that have to use the masks at their best if you want to complete the whole game. Not only when you’re solving a puzzle in a dungeon but also when you’re performing certain things to complete side-quests. There are a lot of side-quests to complete and masks to collect, but luckily you don’t have to memories every little thing. Early in the game you get the Bombers Notebook. In this book you will see a timeline and each time you meet a new (quest related) character, they are placed in the book. Each time you then achieve something for them, then this is recorded in the book. You can even set a alarm, so you get a notification if you have to be somewhere on a certain time in the game. So even thought the game “only” has four different temples to beat, the game offers you much more. My personal feeling is actually that the temples are good and differs and somewhat mind breaking (especially the second one), but the things that I remembered most when I played the N64 version where the side-quests. Even though some might be easy to complete, some actually makes you go crazy (in a good way) and when you finally advanced in solving a side-quest, you get a “Yes-feeling” like there is no comparison. Especially the quest surrounding Kafei and Anju is a quest you will never forget. 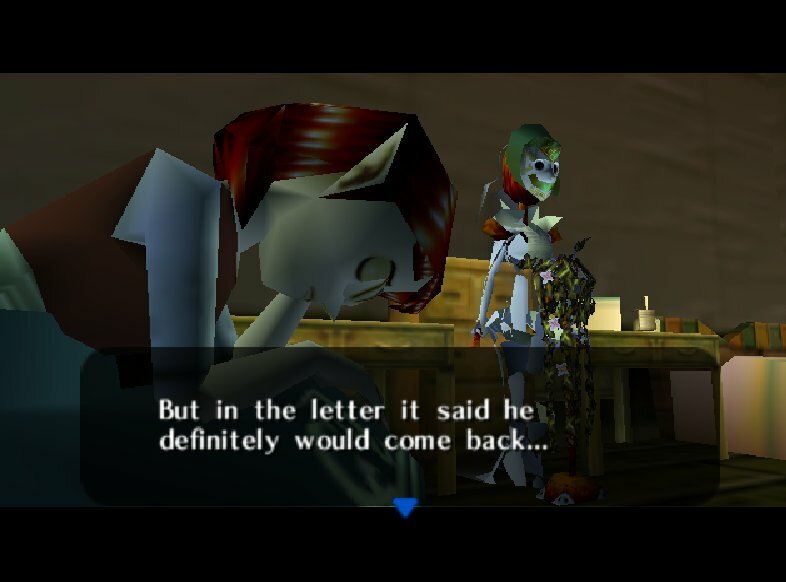 What also is fun to note is that the characters that appear in Majora’s Mask are (almost) the same characters from Ocarina of Time. Only this time the characters actually get a real personality and believe me, it will be these version of the characters that you will remember forever. As I mentioned before, Nintendo looked at the game and didn’t just ported the game to the 3DS. They took a close look to the game and they made come changes. Most of them are really good, you can now actually save on certain points, while in the original this could only be done when you “reseted” to the first day. This is major plus and makes it a lot better to play as a handheld experience. When you’re on the road you can’t always play the game for a long time and losing your game progress because you run out of battery is a real pain, Nintendo made a good change with this one. The graphics looks better then ever before! They builded characters models from scratch and locations looks even more distinguished than ever before. And even though the controls are also better than ever, especially with the giro movement registration, there is one big thing I’m really annoyed about. This is the control of swimming asZora-Link. Where in the original game this was a real blast to do, in the remake this is a real pain to do. In the original you could swim like a dolphin and jump out and in the water and explore the world with a massive feeling of freedom, in the remake this is the case anymore. Nintendo stated that they did this to give better control of the player on the smaller screen, but wasn’t needed in my opinion. The game also comes with a beautiful soundtrack, with the Song of Healing as song you will remember forever *pinks a tear away*. And it’s sound beautiful on the 3DS, especially when you’re using headphones. The Legend of Zelda: Majora’s Mask 3D is a must have for every Zelda fan and/or 3DS owner. It’s a wonderful game packed with emotions, transformations, classic dungeon exploring and more. Believe me, you need this! + Stunning graphics and updated controls.. 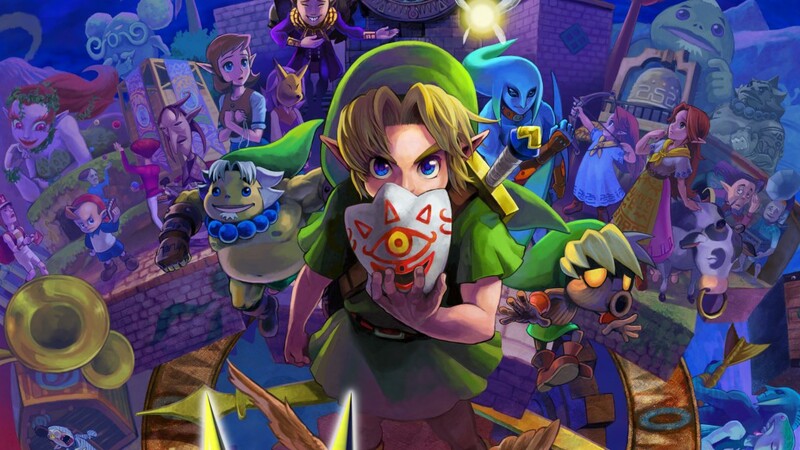 The Legend of Zelda: Majora’s Mask 3D is available for the 3DS, 3DS XL, 2DS, New 3DS and the New 3DS XL. The game offers no Amiibo support. The Legend of Zelda: Majora’s Mask 3D Review and you? I hope you liked the review. I’m eager to find out what your thought are about the game and how you experienced it or if you’re going to buy the game after this review.